Rated 5 out of 5 by denniann2 from a fun and excekkent game i enjoyed this game. it had an interative map and 4? levels of gameplay. you are looking for people that have disappeared in the town and you meet blackrow's widow and she is continuing her late husband's research. i can't tell you too much about what happens with the research because that would spoil it for others. sequel......oh yes, pretty sure of that. Rated 5 out of 5 by 5furballs from Another Mystery Trackers Success!! 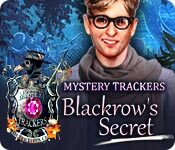 Mystery Trackers: Blackrow's Secret is another great game from this series! Elephant Games set a high standard in interactive story-driven HOA's, and they did not disappoint! The graphics are awesome and the puzzles engaging. The HOS's are well done and challenging. There is a map and happily the little dog Elf is back! It was fun and challenging and I cannot wait for the next one to come out. Rated 5 out of 5 by seahoney from good stuff I was wondering why this far into the day no one had reviewed this game so I decided to play it myself and see. I still have no clue as it is a great and fun HO. It has a good story line and the game moves pretty quickly. Although it showed I had a 90 min trial which I had never seen prior it did end in 60 mins. I like this game a lot and will be buying it on Monday. Rated 5 out of 5 by mrm2006 from Norma Shine Kidnapped! Norma Shine, an incredible actress ... at the height of her career, starts getting death threats. The Police won't help. She's scared. Very scared. Your character, a P.I., has been hired to protect her, but what a poor job you do. Driving along a road, all Norma can say is that "I feel like something bad is going to happen". And, it does. In spades. A ghost appears in the road!!!! The car runs off the road and there's an accident!! Norma is kidnapped and dragged away before your very eyes!!!! Now, you have to find her. I felt the graphics were just ok. Too blue - just too much blue coloring. Is it supposed to be dusk or near dawn? Foggy? Creepy? I don't know because NONE of that comes across. What DOES come across? Someone needs to put away the blue crayon. The voice overs were ok. Norma Shine's reaction during the crash seemed so "fake". The music was great. Appropriate for each scene, rising to a nail-biting crescendo when the occasion called for it. There are 4 levels of difficulty (love the names) - Casual, Semi-Casual, Formal and Black Tie. 4 levels of difficulty and NO "custom". Sorry people. There's the usual journal, inter-active map and a new-fangled device, that constantly needs batteries, that helps you see "things" that you don't normally see. An "eye" indicating you need to investigate that area and what variety of things lie behind that eye! A map is ultimately acquired, which shows where you are and active tasks. PLUS items are in the inventory. (No, the watch isn't broken - the outside piece gets put on last and then click the little button in the center to close it). This was a huge issue when the CE version came out. The HOGS (hidden object games that I came across were strictly list items with some interaction. Not too difficult at all. I had no problems with any of the mini games either. Sorry, to those who dislike helpers. There is a little cute doggy named "Elf" who gives us a hand with things we can't reach. This is a game with a lot of mystery and intrigue. Who has been threatening Norma Shine? And Why? Why are the Police so blase about it and doing nothing? I mean, she's an A-list star! Was that REALLY a ghost in the road? Who was she and what happened to her? Why did she run us off the road? And, even more importantly, who was the figure in black who kidnapped Norma and why? What do they want? Yeah, I knew this would be an interesting game so I purchased the CE version when it came out. I had to! Did you see THOSE SHOES Norma wore in the opening scene? All green and black and shiny patent leather heels - with rounded toes no less (I HATE pointy-toe shoes) - sigh. Exactly what I would wear. I've GOT to get a pair of those shoes - LOL. Happy Gaming! Rated 5 out of 5 by pennmom36 from The Blackrow Line Will Go On Forever! Wake up....wake up....detective, you have been in a horrible car accident, hurry, Elf is trapped in the burning car still! Who is that cloaked figure and why is he taking Norma, the person you are trying to protect? How did you end up in an old abandoned plague infested town? Are there people living here, why? So many questions so few answers, but your investigation will soon shed light upon a dark family secret. The Blackrow family secret of immortality! How can Mystery Trackers ever top this game? 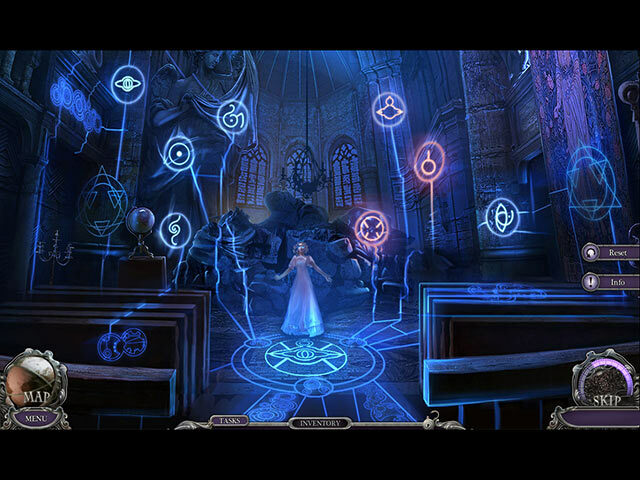 There seems to be a new device with every case and we get to do a field test with the brand new Supernatural Energy Detector which is able to access memories of the past through paranormal energy which will fill you in on the Blackrow mystery a little bit at a time. There are plus indicators on some inventory items which indicates that that item either needs repaired or combined with other inventory items before it can be used. Elf is your right hand er..paw guy once again, helping you during your investigation with such tasks as digging holes or retrieving items in places only Elf can fit. 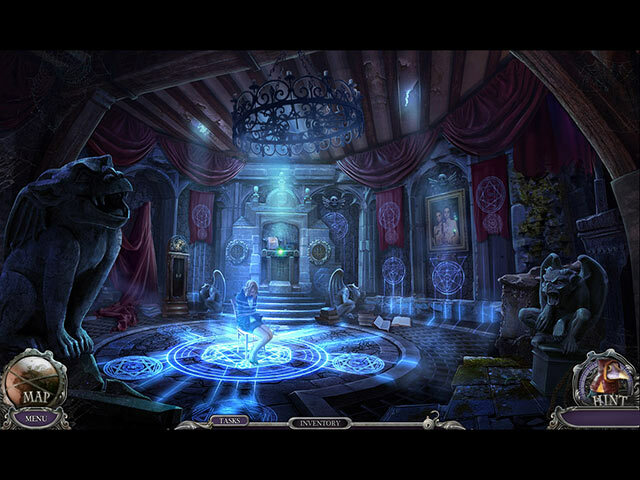 The Hidden Object Scenes are the same as the other Mystery Trackers games, clear scenes with interactive list finds. The mini games at times are very complex but not too difficult such as moving fangs of two different colors to the right and left using arrows and a picker which grabs two fangs at a time. I liked the game that required you to push several levers to manipulate a ball to travel from top to bottom, each lever controlled a gear or pulley or blocked paths but it was a really entertaining game, enjoy! Rated 4 out of 5 by ninja226 from Pretty good standard HO game This is one of the older HO games, but still good. The storyline is forgettable. Actress you are trying to rescue is really pretty, but she only appears a handful of times. Mini games are easy to challenging (time consuming to solve but easy to intuit). I did give up on one game completely. HOS nothing special--no morphing objects, some interactions, but not spectacular, most are easy. 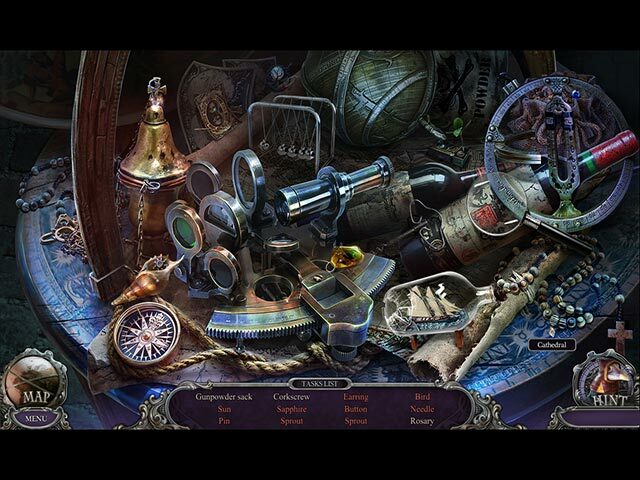 This is a good sleuthing game, well worth a try. Rated 4 out of 5 by ReneThePig from Completed Game - Good one! Just got finished with this and I quite enjoyed it. I've been critical of this developer lately - there's been way too much running back and forth to the point where I lose interest...but not this time. The gameplay was logical and progressed well and it all flowed with the story. The art, music and all of that stuff was typically well done. It was on the creepy side without being too gross. I loved the "Help" character with his plague mask. Made me laugh. I enjoyed this one - and recommend it.